Cutting edge lessons and tips on High Performance, Productivity, Excellence, Entrepreneurship & more. Subscribe for tips on High Performance, Productivity, Wellness, Entrepreneurship, & much more. Ever since e-cigarettes exploded onto the scene a few years ago, manufacturers and the tobacco lobby groups have been engaging in a marketing blitz designed to portray “Vaping” as a perfectly safe alternative to regular smoking. Since then, multiple studies have been published and which demonstrated unequivocally that “vaping” is far from harmless: vaping is as dangerous to your health as regular smoking, and in many cases even more so. In fact, a few weeks ago I talked about a new study (http://tonyhchaime.com/blog/2019/2/3/new-study-sheds-disturbing-facts-about-kids-vaping?rq=vaping) which demonstrated how harmful vaping is to teenagers, a rapidly growing problem worldwide. 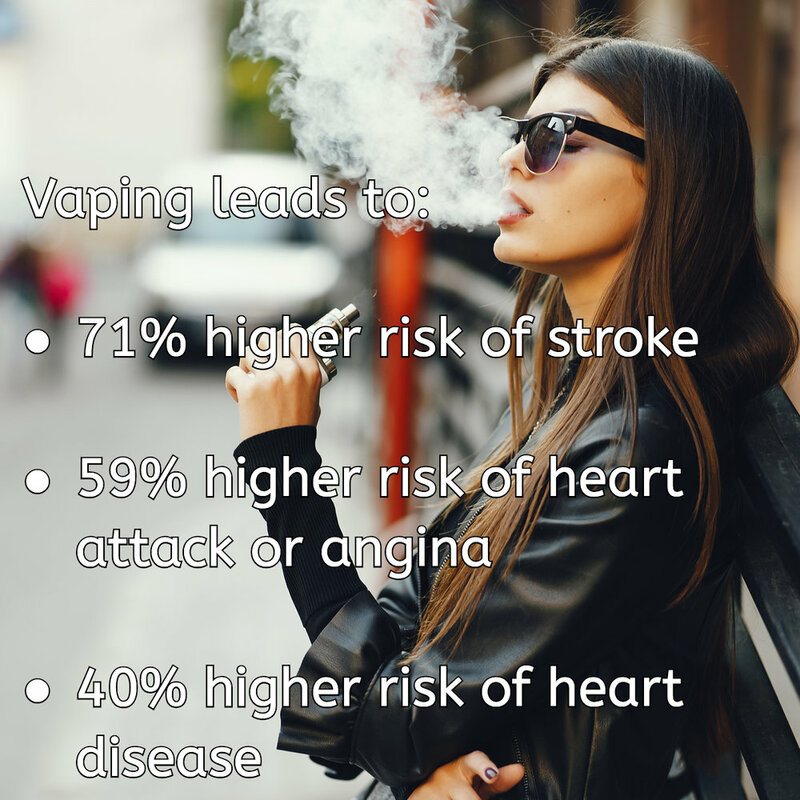 More recently, a large study (over 400,000 subjects in the US) was published (https://www.medscape.com/viewarticle/908725#vp_3), highlighting the significant risks associated with “Vaping”. 40% higher risk of heart disease. Now normally I’m not a fan os observational studies because they often have confounding factors: for example, people who “vape” were probably smokers already, are overweight, may suffer from diseases such as diabetes (etc) so any conclusions drawn may be murky at best. HOWEVER, the researchers in this study DID account for smoking, diabetes and obesity, and the higher risks of stroke and heart disease shown above REMAINED TRUE. This is particularly alarming because of the rapid rise in “vaping” among teenagers and young adults, which the use of "e-cigarettes” up by 900% between 2011 and 2015 in that age group. Multiple scientists (including those from this study) are saying that the problem in e-cigarettes is not nicotine (just like it isn’t in real cigarettes), but rather the other chemicals used in the e-cigarette, which are suspected of causing inflammation in the arteries, leading to increased risk of stroke and heart attack.